I'm cutting it close again on the challenge but I did it, I got my card for the Jingle Belles challenge done in time! The challenge this week over at the Jingle Belles blog is all about ribbon. I had an idea about how I wanted to execute it but I wasn't sure it was going to work until I actually finished it! 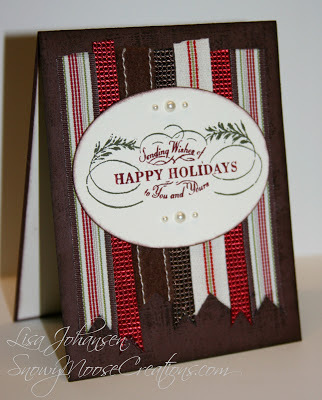 First I used a plaid background stamp on my Chocolate Chip card stock, I didn't want to leave it blank. Then I took 5 different Christmas ribbons from Stampin'Up! (retired) and layered them to create a background. I colored my sentiment stamp with markers and cut that out with the oval dies from SU. It's hard to tell in the picture but the sentiment panel is popped up with dimensionals. I thought the panel looked a little bare so I added the pearls for a little extra visual punch. I'm really pleased with how it came out and I hope you like it too (sorry for the crappy picture, I was in a hurry)! Very pretty card, Lisa! This is a great way to use up leftover pieces of ribbon and the pearls were a great finishing touch to the greeting. Lisa, this is a fabulous design. I love your mix of gorgeous ribbons! Lisa - gorgeous as always. Perfect in every way. The ribbons are just lovely and such a great design. The stamping is so pretty and the pearls really are the perfect finish. You inspire me every week! Oh so clever ... love those ribbony bits ... so very glad you joined us at jingle belles.